Breath-taking image qualityThe third camera in its series, following the D5000 and the D5100, the Nikon D5200 offers a massive leap in image-quality. In addition to the 24.1-megapixel DX-format CMOS sensor for finely detailed images, the new EXPEED 3 image processor provides high-speed operation and excellent, rich colour reproduction – as well as enhanced movie recording. The high ISO sensitivity (100-6400 which is extendable to 25600) delivers brilliant shots in dark or poorly lit environments as well as producing clear images of fast moving subjects. Image creations from any angleThe Nikon D5200’s versatile 7.5cm (3-in) vari-angle LCD monitor provides the ultimate freedom and flexibility to take beautiful shots and movies from virtually any position. You can flip, tilt or turn the swivel monitor to get really creative with your angles. 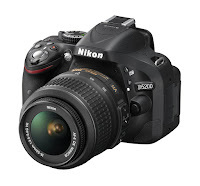 In addition, the Nikon D5200 is an intelligently designed lightweight camera, with clear menus and superior ergonomics, making it a pleasure to maneuver and shoot with. Wireless connectivity to share your creationsWirelessly transmitting images from your camera to an Apple™ or Android™ smart device is possible by using the optional WU-1a Wireless Mobile Adapter. This means you can share images that you are proud of with friends via social networks and email for instant reactions. It is even possible to control your camera remotely from your smart device to help you take beautiful shots without disturbing your subjects. Distinctive HD moviesEffortlessly alternate between shooting stills and Full HD movies with smooth (up to 60i/50i) recording at the flick of a switch. The camera’s subject tracking of moving objects in three dimensions, with full time servo AF (AF-F), ensures focus of moving objects throughout filming. Adding to that, creating movies to be proud of can be achieved with in-movie editing and the camera’s built-in stereo microphone. Inspirational Effect and Scene modesBe even more original with the Nikon D5200 Effects mode. A range of seven special effects: Selective Colour, Miniature, High and Low Key, Silhouette, Colour Sketch and Night Vision can be applied in real time to images and movies through Live View so you can see what your final creation will look like before you shoot it. In addition, in-camera High Dynamic Range (HDR) and D-lighting capture detailed images of high-contrast scenes, increasing creative possibilities. You can also select from 16 different Scene modes – they optimize the camera settings, such as shutter speed, ISO and aperture – to the situation you are shooting. It is great for a quick shot or if you are still learning about D-SLR photography. 16 Scene modes: Automatically adjusts camera settings, including Picture Controls and Active D-Lighting, for optimal results. *1 Compatible with iOS™ and Android™ smart devices. This feature requires use of a dedicated Wireless Mobile Utility application that can be downloaded for free from Google Play™ and the Apple App Store™. An amazing sunset and lots of luck!! !